The Schefflera genus consists of many species commonly used as tropical office plants or houseplants. 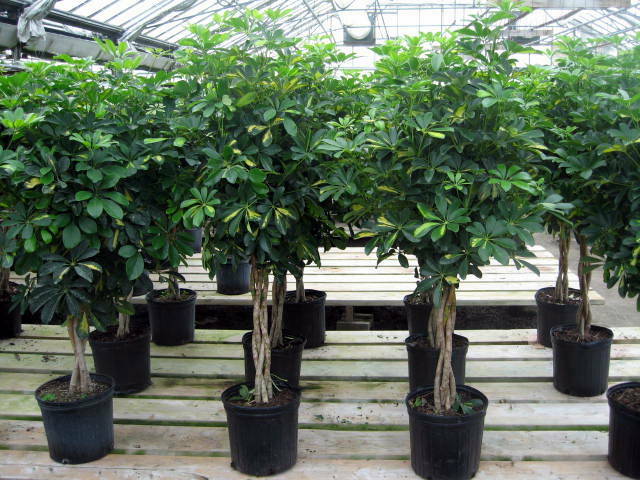 One of our favourites is the Schefflera arboricola. This versatile plant is available in many forms; it is grown as a bush and as a tree. The tree form is often sold as a braid, with three stems woven together. The bush form can be small for use as a table-top plant, or as big as 3-4 feet in diameter. The tree form is usually supplied at about 4 feet in height, but can be found as large as 8-10 feet. This plant is a great alternative to the Ficus benjamina. It has the elegent look of a Ficus, but is much less temperamental. 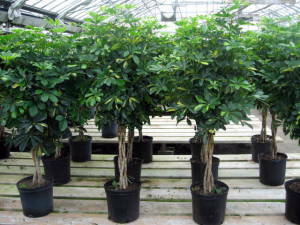 Although it requires good light, it can tolerate lower levels than would be required by a Ficus tree. We have successfully maintained this tropical plant in north and east windows. In lower light it will drop some leaves, particularly in the center of the plant, but it will adjust and settle down if not overwatered. This plant’s common name is Dwarf Umbrella Tree, as it resembles the larger leaf variety, Schefflera ‘Amate’ or Umbrella tree. This smaller version is available in many more varieties. The ‘Capella’ has obvious yellow blotches on the leaves (top right image). This variety requires a bit more light than the standard green plant. Another variety, ‘Trinette’ (top left image) has much more yellow on the leaves, bright yellow to a pale yellow that is almost cream coloured. The arboricola may produce aerial roots hanging down from the branches that give the plant an interesting and unique appearance. This plant likes to dry out slightly between waterings. Check the soil a couple of inches below the surface and water well when it feels dry. Good drainage is essential. The roots do not like to be soaking wet. Fertilize monthly except during winter months. Check the leaves often for scale or mealy bugs.